Eileen O'Riordan flanked by her daughter's former bandmates, Mike and Noel Hogan. THE MOTHER OF Dolores O’Riordan fought back tears today as she accepted an honorary doctorate of Letters from the University of Limerick, on behalf of her deceased rock star daughter. The body of the world-famous singer with The Cranberries was found submerged in a bath in her bedroom in a London hotel, on 15 January last year. An inquest last September found the iconic performer had drowned while intoxicated with alcohol. Honorary Doctorates of Letters were also bestowed on O’Riordan’s bandmates, siblings Noel Hogan (guitarist) and Mike Hogan (bassist), as well as drummer Fergal Lawler who was unable to attend today’s event. O’Riordan’s devastated mother, Eileen, who clutched the college gown that her daughter would have been wearing to accept her award, admitted the special day was tinged with sadness. “It is (sad), it is really, you know… I suppose we have to move on haven’t we…we have to,” she said. I know that (Dolores) is happy and she is in heaven, and that makes me happy. Flanked by the Hogan brothers, she expressed delight the band decided to record a final album in memory of Dolores. However, Eileen revealed she has not yet listened to the first single All Over Now, released last Tuesday on her daughter’s first anniversary, which is taken from The Cranberries final new album In The End, due out on 26 April. “What I find very hard is somebody else singing (the band’s) songs. I find that kind of (difficult),” she added. Accepting her daughter’s award was “a great honour”. “I feel awed really. I find it hard to comprehend and take it all in,” she added. Dolores wasn’t aware how much she was loved by her native city and county, Eileen said. No, I don’t think she did (know). She loved Limerick and she was very proud of Limerick and she was happier in Limerick than anyplace else. I didn’t realise how much she was loved. I keep telling the children how much everyone loved her, and what a support it is, and how comforting it is to us as a family. For a few brief moments, smiles replaced their sadness at missing Dolores, as Noel Hogan joked that O’Riordan would have got “a skit” and “a great kick out of this”. A few years before O’Riordan’s death, she and the rest of the band were approached by UL about the idea of being awarded honorary doctorates, however it was not to be, due to the band’s work commitments. “Even when this was brought up about four years ago I remember (Dolores) telling her brothers, who had different degrees, that she’d be more qualified than they were…That was her personality so I think she’d be really loving this today,” Hogan added. “Proud” of getting their honorary awards, the Limerick brothers acknowledged their emotions were also “very mixed” by celebrating with their families without Dolores. 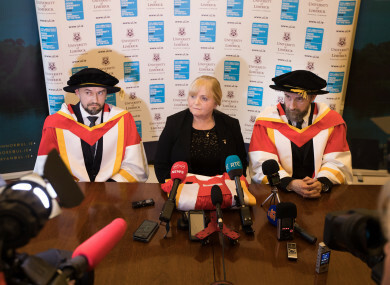 Email “Dolores O’Riordan's mother collected an honorary doctorate on behalf of the late Cranberries singer”. Feedback on “Dolores O’Riordan's mother collected an honorary doctorate on behalf of the late Cranberries singer”.